Story of the Lost Battalion, this Norman Rockwell painting, appeared on the cover of The Literary Digest published March 1, 1919. An alternate title for this work is Soldier Telling War Story. 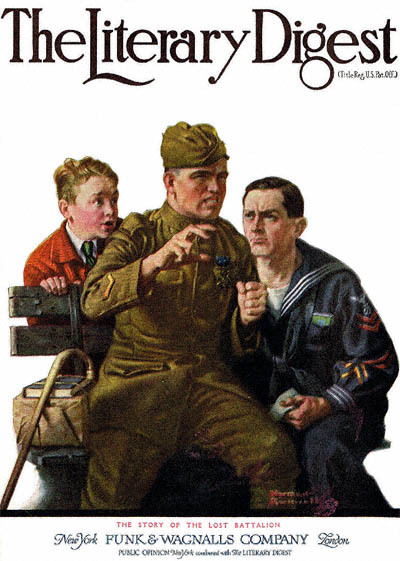 The Digest featured Rockwell art on its cover eight times in 1919 alone. This painting was Rockwell's fourth picture featured on the cover of The Literary Digest. The original oil on canvas painting, 25.5 x 23.5 inches or 65 x 60 cm, is part of the collection of a private collection. World War I was still not officially over at the time Norman Rockwell painted this cover. The fighting had stopped, but no formal peace declaration had yet been signed. In this painting, we see a soldier and a sailor sitting on a park bench. A boy is standing behind them. The soldier is telling a gripping war story. At his side is a package and his cane. Obviously, he was wounded in battle. He appears to be reliving a hand-to-hand battle, judging by his hands. Story of the Lost Battalion was only one of 47 Norman Rockwell Literary Digest covers; here is the list of more Norman Rockwell Literary Digest scans. The sailor seated on the bench is listening intently to the narrative. He probably has war stories to tell as well. The boy is the most interesting character to me. The expression on his face shows his awe for the soldier's story. The boy is experiencing the war vicariously through the soldier. Do You Have A Great Story, Opinion Or Contribution About Story of the Lost Battalion?